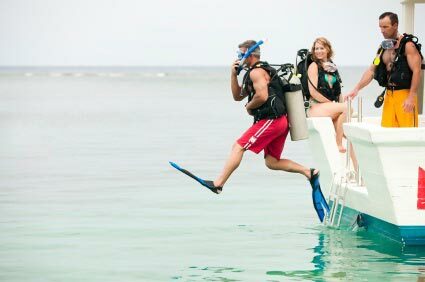 Cabo San Lucas scuba diving is great for beginners and experts. The best place to go while scuba diving in Cabo is the “sandfalls” along the canyon in San Lucas Bay, which is only a five-minute trip from the Cabo marina. These world famous sand falls were discovered by the explorer Jacques Cousteau. Here you will have the oppurtunity to see eels, parrotfish, lobsters and more. Also, scuba diving at Land’s End puts you up close and personal with the resident sea lion colony. Scuba diving near Neptune’s Finger in Cabo Bay provides a good chance of a meeting a sea turtle. You can also arrange to get trips to further places such as Santa Maria Beach, Gordo Banks and Cabo Palmo. A two tank dive in the Cabo area is around $65-$75 dollars, while a one tank dive is about $50. If you would like a trip to a a further location, the prices are around $150. Resort courses are available for around $100. Places also offer equipment rentals, including pressure gauges, dive computers, and wet suits. If you are going to go scuba diving in Cabo during the winter, wearing a wet suit is highly suggested. New to Scuba Diving? Open water certifications are available for around $500. Manta Scuba Diving (624-144-3871) offers many scuba diving opportunities in Cabo San Lucas. You may even get the chance to explore a shipwreck!